A man will be spending the next four years in jail after he was found guilty of having a Glock pistol and 13 matching rounds for the weapon. 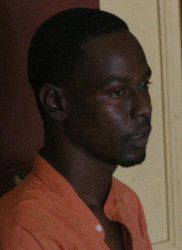 Nabadamingi Gobin, of Aubrey Barker Road, was sentenced and also fined a total of $120,000 at the conclusion of his trial in a city court. The charge against Gobin had stated that on July 16, 2015, at East Street, he had the weapon and ammunition without having a firearm licence. Prior to Magistrate Judy Latchman handing down her ruling, she highlighted various facts that were presented in court by both the prosecution and the defence. According to the magistrate, during the course of the trial the court heard that Gobin had offered to pay police officers $300,000 so that the case against him would be dropped. It was stated that such a statement was made although there was not a record made of it in the station diary. The magistrate stated further that based on the evidence presented, the defendant was found with the firearm and ammunition in his pants crotch and had control of same. Attorney George Thomas, who represented Gobin, stated in mitigation that his client is the father of three, including a three-month-old and is the sole breadwinner for his family. Before giving her ruling, the magistrate stated that she had taken into consideration the fact that the defendant was a first time offender, the prevalence of gun crimes and the need to prevent other persons from committing the offence. She subsequently sentenced Gobin to four years in jail for the gun charge along with a fine of $60,000 and four years in jail for the ammunition charge also with a fine of $60,000. The sentences are expected to run concurrently. Gobin remains before the court as a co-accused in the murder of Mocha Arcadia resident Ryan Clementson as well as the sole accused in a $17M burglary, during which the gun he was jailed for was stolen.